This female bobcat was tagged and outfitted with a GPS collar, which she'll wear for 300 days. The cat began to wake up from its slumber. As bobcats return to New England following decades of conservation and forest regrowth, biologists want to learn more about what these mysterious wild cats are up to. So using tools like GPS collars, Hawley and his team are examining bobcat diets and fertility rates, trying to unravel how the cats act in the wild, and increasingly, in our backyard. Bobcats are about two-to-three times the size of the average house cat. These wild cats are elusive and quick, and as populations have gone up, Hawley said lots of people confuse them with mountain lions. 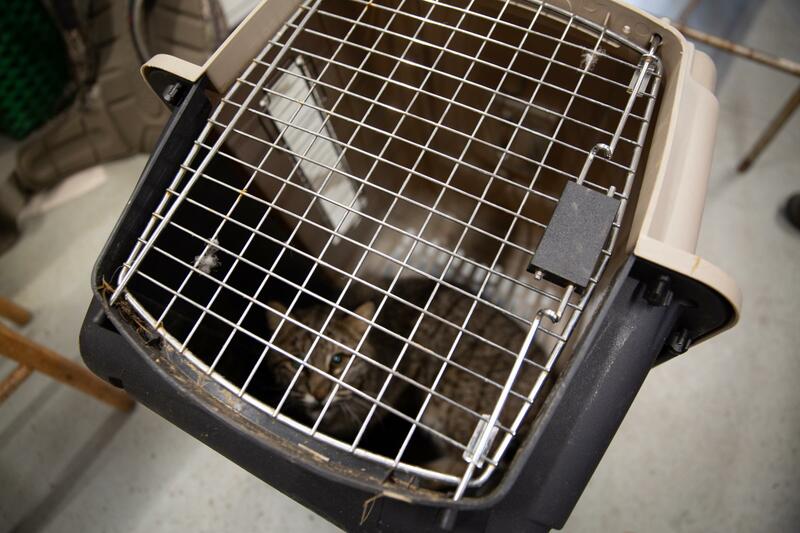 This female bobcat was captured in Lebanon, Conn. Biologists at the state are trying to get a better sense as to where these wild cats are and what they're doing. In addition to its tufted ears, one of the bobcat’s differentiating features is its short “bobbed” tail. Many bobcats are also spotted, but Hawley said lots of Connecticut bobcats don’t have a large amount of spots -- further adding to the mountain lion confusion. This day’s bobcat started to wake up from its transport slumber. So before biologists could work on it, it was re-drugged using a long pole tipped with a syringe. After about 15 minutes, the cat was under. Hawley pulled the bobcat out of the carrier and popped it on a long metal table. 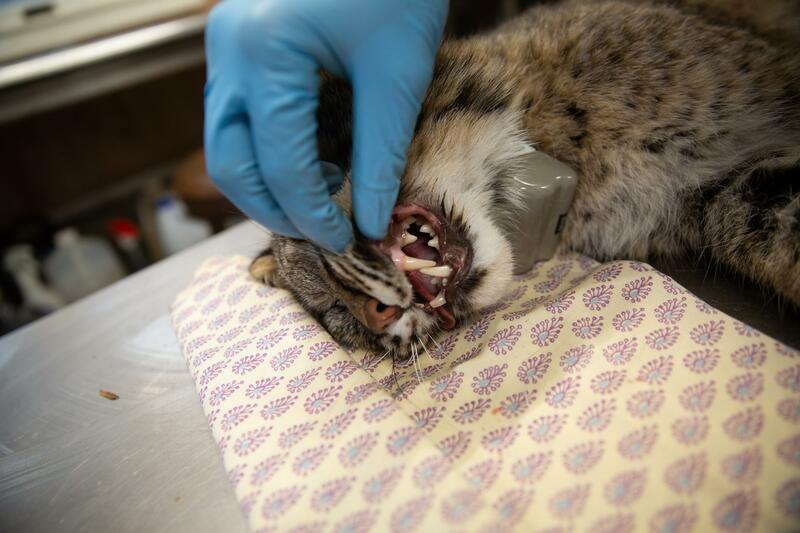 Scientists removed a few bloated ticks and a small molar to get the cat’s age. The head and neck were measured, DNA was taken, the cat’s ears were tagged, and the animal was outfitted with a GPS collar, which will fall off automatically in 300 days. 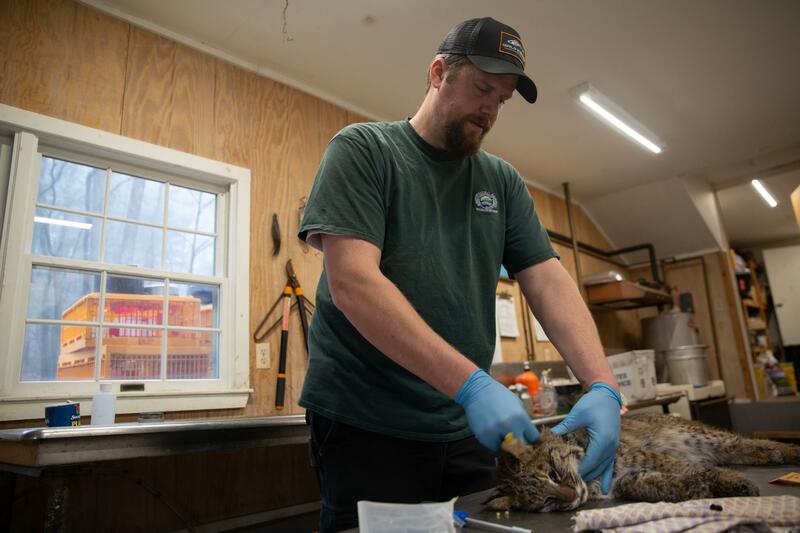 Jason Hawley works on a bobcat in a lab at Sessions Woods Wildlife Management Area in Burlington, Conn. After some collaring and sampling work, the cat was released. “Most people think of bobcats as needing woods and living out in the middle of nowhere, but we’re finding they’re very adaptable animals,” Hawley said. So far, Connecticut’s project has collared about 85 cats, tracking bobcats through rural forests -- and even one in Connecticut’s biggest city. “It’s pretty amazing. He’ll go right into, almost, downtown Bridgeport and use some of the park land that they have in there,” Hawley said. Regionally, sightings are also on the rise. Vermont wildlife officials say bobcat populations are “healthy” and “well-distributed.” And numbers are also up in Maine, increasing alongside the bobcat’s bigger cousin, the Canada lynx. Back in Connecticut, Hawley said bobcats, which in the mid-20th century were subject to a bounty, can now be seen in all towns. The bobcat's teeth following the procedure. The cat was outfitted with a GPS collar, which will ping location data on the cat. Coordinates they’re getting from those GPS collars are helping to pinpoint den sites. Letting field biologists examine bobcat kittens in the wild and providing opportunities that otherwise would be nearly impossible. All that GPS data are also providing something else: insights into bobcat personalities. Take, for example, another cat Hawley’s team tagged in southern Connecticut. As for the cat I met? It was released the next day. Right back in the town where that coyote trapper accidently picked it up. Hawley said the bobcat will probably have her first litter this spring. So if all goes well with her collar, it’s possible biologists just may see this cat again -- this time, with kittens. Have you ever looked closely at a squid? No, the calamari on your plate doesn’t count. Sure, it might seem to have come from the pages of a science fiction novel. But squid are far from fictional.